Chris Colfer's The Land of Stories has come to an end. And while it's sad, the conclusion was fabulous. When we last saw our beloved twins, Alex had been placed under an evil spell and was wrecking havoc. So now it's time for Connor and his army to try to save Alex, fight the witches AND beat the Grand Army. Phew! Chris Colfer does an amazing job of tying up all, and any loose ends. All our characters are revisited. Any questions you may have had are answered. Characters you may have wondered about, or forgotten about, are back. And we even get a glimpse into the future. 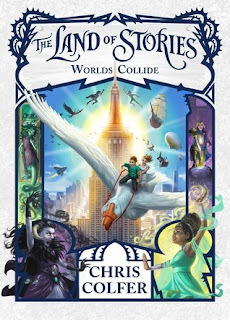 The Land of Stories has been amazing for a couple reasons. 1) I absolutely loved the series. I would mark down the date for the next books' release and anxiously wait for it. 2) Ethan discovered the series last summer. We spent many days discussing it, making predictions and sharing our favourite moments. This time around, we argued over who got to read it first, and then shared our favourite moments.